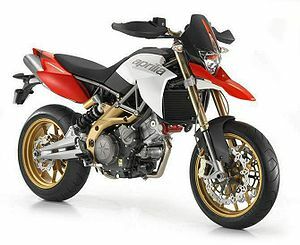 The Aprilia SMV750 Dorsoduro is a large format supermoto bike. The Aprilia SMV 750 DORSODURO is an extreme motorcycle for the extreme rider, the rider who refuses all compromise in his quest for the best. Once again Aprilia has amazed the motorcycling world with another highly innovative design, destined to dominate the maxi motard segment. 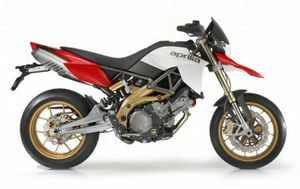 The Aprilia SMV 750 DORSODURO is not just another twin cylinder motard, but a motorcycle that embodies all of Aprilia’s vast experience in competitive supermotard racing, a speciality in which Aprilia has so often dominated the competition. The ultimate mix of incredible agility, sports performance, essential styling and quality build, and combines features taken from the worlds of supersport and supermotard motorcycles (including top competition machines). This concentration of performance and technology is build for absolute riding satisfaction and fun. A special bike indeed, extreme and elite, the SMV 750 elevates its rider to the class of a true professional. A riding position carefully calculated to deliver total control, a mighty 95 horsepower engine and an amazingly agile chassis are the distinctive features of the Aprilia SMV 750. No bland machine for the masses, but a true thoroughbred that only expert riders can really appreciate, the SMV 750 carries you into a world of high performance and even higher emotions that very few other motorcycles can enter. Graced with the agile handling of all motards, the SMV 750 adds a level of power normally only found on road-going supersports. An advanced engine and an exceptional chassis (typical of all Aprilia motorcycles) are the trump cards of the SMV 750, which also boasts sporting looks and a level of agility never before experienced on a twin. Lightweight, agile, and powerful, the SMV 750 benefits from a new generation of engine and some of the most advanced technical solutions found on any motard. Thanks to advanced electronics, its compact 90° V twin engine delivers power that rivals or exceeds that of many larger twins. And as Aprilia traditions demand, the chassis is simply unrivalled. 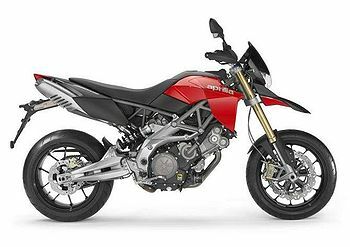 Developed to deadly effect on the super-specialist SXV, this mixed steel trellis and aluminium frame has become the hallmark of Aprilia motards. With technical specifications far in advance of the competition, this frame sets new standards for rigidity and agility. But ‘essential’ certainly does not mean ‘basic’ on the Aprilia SMV 750 DORSODURO. Components and performance are prestigious and the level of finish is worthy of a true flagship model. Radial calipers, hydraulic clutch, ride-by-wire engine control, wave discs, and matrix instrumentation with on board computer all combine to make the SMV 750 unique. With a power to weight ratio of a pure sports bike, the Aprilia SMV 750 can thrill even the most performance-hungry rider. On essential machines like the Aprilia SMV 750, the minimalist and aggressive bodywork is nothing more than a frame for motorcycling technology, with engine and chassis becoming central to the overall design. The SMV 750 is a radical, acrobatic, sports motorcycle with no space for frills or parts that are not essential to delivering maximum riding pleasure. That is why body panels are reduced to a minimum. Just like a real racing machine, the SMV 750 DORSODURO eliminates everything the rider does not actually need, including passenger footrests (available as an optional accessory). And no frills means a clear view of the bike’s amazing technical components. The Aprilia SMV 750 is a concentration of pure technology, as you can clearly see from its mean, sporting lines. And aggression is expressed not only through masses of power and torque, but through extreme agility too. Though every part on the SMV 750 is designed to be as light as possible, finish and quality are nevertheless superb. The Aprilia SMV 750 is built to satisfy its rider in every sense of the word. The centre of the bike is impressively compact to facilitate movement under sports riding conditions. The rider really does become an integral part of the machine, shifting weight effortlessly to control power output under all riding conditions, even on circuits where classic motard wheelies and power slides are the order of the day. The Aprilia SMV 750 is incredibly slim and agile, with a riding position that puts you in total control. It only takes a few metres on a SMV 750 to learn how to control the bike exactly as you want, and to develop a perfect symbiosis between man and machine. The knife-sharp tail houses a twinned exhaust, a solution that not only gives the bike a mean, aggressive look but also achieves perfect symmetry and ideal weight distribution. Aprilia’s generous and ultra-modern V90 engine has already established itself as a leader in performance and technology. On the SMV 750 various aspects of the engine have been modified to adapt power delivery to suit the acrobatic nature of the bike. Endless hours of bench and road testing have led to the definition of an ideal mapping, allowing this twin cylinder power plant to set new records for its size and to surpass many engines of far greater displacement too. The latest generation injection system uses micro-spray injectors. Combined with optimised fluid dynamics, this solution ensures optimal combustion for maximum power and an extremely clean burn. Sophisticated electronic engine management establishes the Aprilia SMV 750 DORSODURO as the supermotard the others have to beat when it comes to performance. Aprilia was the first manufacturer to use ride-by-wire technology on a motorcycle. This sophisticated technical solution is not intended to replace rider input but to assist the rider in getting the very best possible performance from his motorcycle. The Aprilia SMV 750 DORSODURO is equipped with the second generation of electronic throttle control. More precise and sophisticated mapping also contributes to improved engine management. Ride-by-wire control optimises throttle opening on the basis of a number of parameters, including engine speed, the gear selected, air flow, twist grip position, and temperature. The engine is therefore always able to deliver its best performance in acceleration by adjusting its torque curve to give a more satisfying and thrilling ride. The advanced electronic technology on the SMV 750 also delivers smoother and fuller power at low to medium engine speeds, optimising the functioning of the engine at low loads, when the throttle is only partly open. Thanks to its high-tech systems, Aprilia’s V90 engine delivers an amazing 95 hp at 9,000 rpm with 8.25 Kgm of torque at 7,000 rpm, record values for a 750 cc twin. This level of engine performance places the Aprilia SMV 750 DORSODURO in direct competition with many bikes powered by far bigger engines. A latest generation ECU manages all engine parameters, with a CAN network carrying all signals to an instrument cluster that incorporates a self-diagnostic terminal. 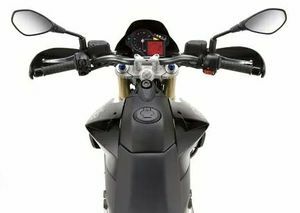 The CAN line uses only two wires to handle all data, dramatically simplifying the electrical system and reducing the overall weight of the motorcycle. Frame Modular steal trellis secured to albumin side plates by high steal bolts. Rear Suspension Aluminium alloy swingarm with reinforcement truss. Hydraulic shock absorber adjustable in spring preload and rebound damping. 150mm Wheel travel. This page was last edited on 1 February 2011, at 21:45.